It’s a commonly known fact that science and mathematics go hand in hand. Rarely can you work in a scientific field without involving mathematics in some shape or form, and rarely can you teach the sciences without having to turn to math for more precise data. Because these two subjects are so closely intertwined, it’s quite common to find them being taught together, especially in early educational years. If you plan to teach either of these subjects in the state of Texas for grades four through eight, you may end up leading classes in both subjects at once. Texas law requires all aspiring teachers to take and earn a passing score on the TExES exam in order to complete their certification training. Teachers in your particular field will be given the TExES Mathematics/Science 4-8 exam. Due to the nature of your field, the resulting exam will be fairly lengthy, spanning 120 questions and five hours in testing duration. Each question on the test will be in multiple choice format. The test will also deal with a multitude of subjects related to your field, including Science Learning, Instruction and Assessment (6 percent); Number Concepts (8 percent); Earth and Space Science (11 percent); Patterns and Algebra (11 percent); Life Science (11 percent); Geometry and Measurement (11 percent); Physical Science (11 percent); Probability and Statistics (8 percent); Scientific Inquiry and Processes (11 percent); Mathematical Learning, Instruction and Assessment (8 percent); and Mathematical Processes and Perspectives (5 percent). Scoring well on this exam will require only the most thorough study tools. 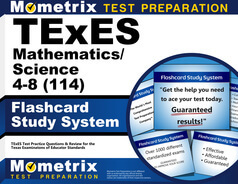 To help you prepare for this exam to the best of your ability, the Mometrix Test Preparation team wants to offer you our TExES Mathematics/Sciences 4-8 practice test. This practice test is designed to familiarize you with the full exam’s materials and contents, which you can review and complete at your own pace. Feel free to use our practice test to not only learn how the actual exam will work, but which areas of the exam may need more of your attention as you study. For further help as you prepare for the TExES exam, feel free to refer to our TExES Mathematics/Sciences 4-8 study guide, also featured on this page. Good luck, and happy studying! Mometrix Academy is a completely free resource provided by Mometrix Test Preparation. If you find benefit from our efforts here, check out our premium quality TExES Mathematics/Science 4–8 study guide to take your studying to the next level. Just click the TExES Mathematics/Science 4–8 study guide link below. Your purchase also helps us make even more great, free content for test-takers.